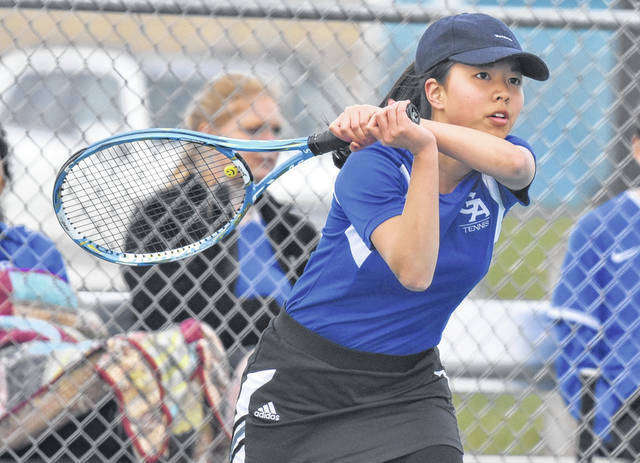 GAHS sophomore Amane Sawamoto returns volley during a match against Jackson on April 5 in Centenary, Ohio. PORTSMOUTH, Ohio — Moving on … again. The Gallia Academy tennis team had one player advance to the district level following the 2018 Division II sectional tournament held at Portsmouth on Tuesday. Senior Pierce Wilcoxon, for the fourth consecutive postseason, is headed back to Athens after finishing third with a 4-1 in first singles. Wilcoxon earned victories over Jackson, Minford, Portsmouth and Portsmouth Clay, while dropping a match to Wheelersburg. Singles competitors Kirsten Hesson and Amane Sawamoto both suffered early exits in the tournament, suffering losses to Logan Elm. Gallia Academy’s first doubles tandem of Katie Carpenter and Thomas Hamilton picked up a win in their first-round match over Portsmouth Notre Dame, but were defeated in the second round by Miami Trace. In second doubles competition, the team of freshman Nick Mayes and junior Brittany Masters suffered a first round defeat to Jackson. The 2018 Southeast District tournament — which features four sectional winners from the East District and eight sectional winners from the Southeast District — starts at 10 a.m. May 19 on the campus of Ohio University in Athens, Ohio.